highhope - Brian Enos's Forums... Maku mozo! for Call shots in dry fire, I think it's to confirm the sight picture in your head clearly when you break/press the trigger,(just like asking yourself, "am I on A"). It includes two parts: 1 call sight picture, 2 call your trigger press. 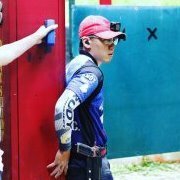 Do not track your sight during transition, just like use a mouse on computer, move your eye to next target, focus on a spot of the target, move the sight to that spot.